Listen to the podcast. Download the podcast. Find it on iTunes and Podcast.com. Charter Sponsor: Active Endpoints. Sponsor: TIBCO Software. People talk about “The Cloud” as if it is one unified platform, but it’s the exact opposite, argues Jim Kobielus, senior analyst at Forrester Research. Misconceptions of what “The Cloud” is and a general lack of standardization among the vendors offering cloud computing services is bound to be confusing to organizations contemplating moving enterprise applications out onto the Internet. In a podcast featuring a panel industry thought leaders, moderated by yours' truly, we offer new insight into the current status of cloud offerings and the future need for open standards and governance. 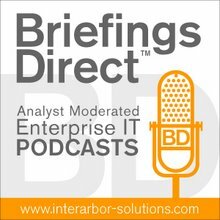 Who is using the cloud for what -- and where this trend is going -- are discussed as the podcast panelists unpack the Platform as a Service (PaaS) concept in BriefingsDirect Analyst Insights Edition, Volume 40. But before everyone jumps on the cloud bandwagon, they need to know what they are getting into, and Kobielus warns of dangers ahead if the cloud vendors end up returning to the era of silos. With each vendor creating their own proprietary version, the cloud could transform service-oriented architecture (SOA) into “silo or stealth pipe” architecture. “The current state of cloud computing goes against the grain of SOA, where SOA is all about platform agnosticity and being able to port services flexibly and transparently from one operating platform to another,” Kobielus argues. "This a real challenge for Microsoft. It's like the open systems discussion we had a little while ago," says David A. Kelly, president of Upside Research. "It makes more sense for players that actually earn their revenue in a different form than traditional operators, because someone like Amazon has a core business. "Someone like Microsoft is kind of painted into the corner at the moment. That's a challenge not just for Microsoft, but for other traditional vendors. They can expand into this new area by offering low-cost services that take away from competitors, but don't hurt their core business," said Kelly. But the cloud may simply not yet be at the stage of maturity where vendors can all get together and sing "Kumbaya." Jonathan Bryce, co-founder of Mosso, a cloud services provider at Rackspace, says vendors and providers are still getting their acts together. That doesn’t mean everyone is afraid to try out cloud computing. Developers, always a curious and adventuresome bunch, are already flying off into the clouds that provide them with easy access to compute power in the PaaS mode. Beyond just being a developers’ playground, the panelists see the cloud as eventually hosting Web-based Business Intelligence (BI), data mart, data mining and outward-facing B2B and B2C applications. Meehan suggests that the governance or “adult supervision” needed for the cloud can build on what has already been done with SOA. He sees the cloud has the extension of service-orientation. He argues that not only is SOA not dead but the past decade of work on industry standards for services will allow organizations to take advantage of PaaS for business applications. So join our guests and analysts as they to dig into the enterprise role of PaaS.